Prep Day: Over medium-high heat, in a large nonstick skillet, add the crumbled sausage. Stir and break up with wooden spoon or heat-resistant spatula until the sausage is browned and cooked through, about 10 minutes. Place on white paper towels to drain and pour remaining grease, once cooled, from the skillet into a glass jar or aluminum can for disposal. Place the butter in the skillet and melt over medium-high heat. Add the eggs, stirring frequently with a wooden spoon or heat-resistant spatula until they’re scrambled and cooked through, about two minutes. Add the cooked sausage and salsa to the egg mixture and stir gently. Remove from heat. Warm the tortillas as directed on package. 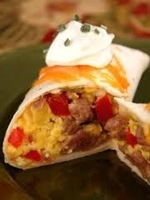 Place about 1/2 cup of the egg and sausage mixture onto each tortilla and sprinkle each one with cheese. To form the burrito, fold the sides of the tortilla in toward the middle and then fold up from bottom. Serve immediately or freeze. To Freeze: Lay a freezer bag flat and place the burritos inside so they are lying side by side and not overlapping. You may need to use multiple bags depending on how many burritos you are freezing. Close the zipper most of the way and then press out the air to protect against freezer burn. Finish closing the bag completely and freeze as soon as possible. Serve Day: take the burritos out of the bag and wrap in a plain paper towel. Leave it wrapped in the paper towel and microwave until hot, about one to three minutes on high, depending on your microwave. Enjoy!